Clark Kent and Lois Lane are sharing a celebratory drink in a Quaraci hotel bar when Clark receives a message from one of his sources. He rushes off and changes into Superman to investigate a lead on illegal weapons being smuggled into the Middle Eastern country. In short order he is flanked by a group of men in armor and after Superman tries to reason with them the men attack. The battle is fierce but in the end Superman throws the last punch. He confronts one of the men but after Superman demands to know where they came from the man bursts into flame and dies. Elsewhere Lex Luthor meets with his psychoanalyst and asks the doctor to not hold back in her diagnosis. She tells him that because of the abuse he suffered as a child and the early rejection by parental authority he's developed a malignant narcissism that has made him a sociopath and psychotic megalomaniac. Luthor points out all of his accomplishments and insists that he is above simple psychotherapy and tells her to come up with a better diagnosis that better fits a man of his caliber. After the session Luthor meets with one of his minions and reveals that the attack on Superman in Quarac was set up to inject him with tiny nanites probes that would map his genetic structure and allow Luthor to attack the Man of Steel through his DNA. Lex put a tiny death machine inside Superman and the Man of Steel doesn't even know it. Three weeks later Superman is flying over Metropolis when Luthor's attack begins. Superman's hand is suddenly wracked with pain and he crashes to the ground. He tells the bystanders that have come to help to stay back because he doesn't know what's wrong. Superman looks at his hand and wonders if it is some kind of infection and by the looks of his hand and forearm that infection is spreading. Story - 5: For the past few months I have been looking forward to the start of Andy Diggle's run on this title. Part of that was because I was pretty much done with Grant Morrison's time on ACTION COMICS but mainly I was sucked in by the interviews and previews that were coming down the pike. Everything looked so good that I could hardly wait for the run to begin. Then it was announced that Diggle was leaving the title before finishing his first story arc and suddenly that excitement and anticipation was tainted with the knowledge that no matter how good or bad Diggle's first issue might be in the back of my head I would always be thinking, "But he's not going to finish the story." I was worried that it would color my perceptions of this first issue so much that I would end up hating it. In fact, I loved this issue. As much as I have enjoyed what Scott Lobdell has been doing with the character over in SUPERMAN this is my favorite Superman comic since the start of the New 52. The opening scene with Lois and Clark proved that Diggle knew how to write both of those characters and there was some nice romantic tension on page three that made me miss seeing these characters interact as colleagues. Then Superman takes center stage and again Diggle shows us that he has a good handle on who this character is and what he represents. The internal dialogue was great. "And I'm here to protect, not to provoke." "I tried to be reasonable. Didn't throw the first punch. I'll throw the last." He even had Superman try to talk things out first and give the villains a chance to power down and surrender instead of blindly flying into them with the glowing red eyes of anger. It was all so...Superman and in a few short pages Diggle explains who the character is and what he represents. Thankfully the issue didn't peak there. 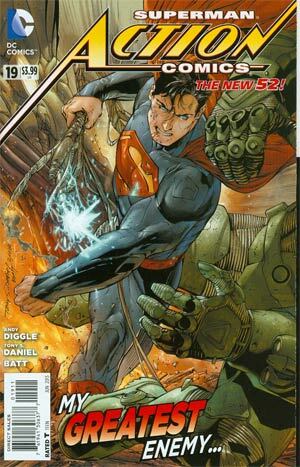 One of my big complaints about the Superman side of the New 52 is that Superman's greatest villain had been given what I felt was short shrift. Sure he was treated as the smartest man in the world but he really didn't do anything and acted rather cowardly in places. Even his brief appearance in H'El on Earth didn't do a whole lot for me. Much like Superman Diggle takes the time to really show us what makes Lex tick as a character. While he continues the whole, "I'm the smartest man in the world," thing it feels more organic here. His hatred of Superman hasn't been fully explained but we definitely get the sense that he has issues with the fact that the Man of Steel is an alien. More than anything he's just evil. I am not getting the sense that Diggle wants to continue the whole, "I am the smartest man in the world and I could have been so much better if Superman hadn't come along," characterization that was so popular starting around 2003 and moving forward. Lex has plans for the world. Superman is in his way. That needs to be dealt with. It's simple and through the scene with the psychotherapist we get to see that Lex is a fully rounded character and not just a bad guy for the sake of being a bad guy. By mentioning his messed up childhood the reader can feel something for him while still recognizing that he is the villain of the piece. Mainly I liked how old school this story felt while still fitting squarely in the contemporary DCU. The basic plot of this story would feel right at home in just about any era of Superman but Diggle manages to make it feel fresh and new. Lex Luthor trying to kill Superman with some bit of advanced science is an old song but because Lex has been off the table for the last year and a half in any kind of meaningful way it doesn't matter. 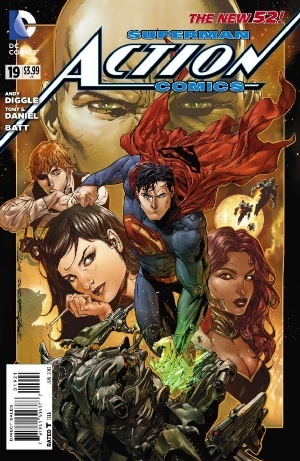 For a new reader that might be dealing with the Lex/Superman rivalry for the first time it is fresh and new. For a long time reader like me it feels like a homecoming. Everything is in place for a great Superman story. It's just too bad that Diggle won't be around to finish it. I think he could have been one of the great Superman writers of all time. Now we'll never know. The only thing we can do is enjoy the ride while it lasts and hope that the next writer brings the same sense of fun and excitement that Diggle brought to this first issue. Art - 5: Like the writing the artwork in this issue had me feeling like a kid again. Tony Daniel is a very talented artist with strong storytelling skills. Those skills were on display in the first scene with Lois and Clark where the romantic tension was very clear on the page. 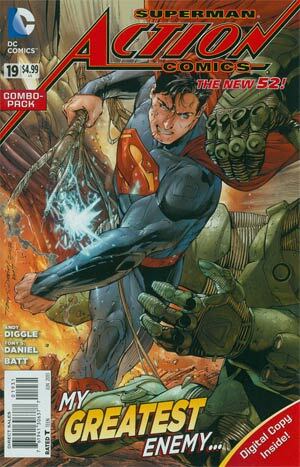 The fight between Superman and the armored goons was exciting, well-paced and Daniel only had the glowing red eyes of anger in the heat of battle. The scene with Lex was great as well and I really got the sense that the psychotherapist was afraid of the man she was being forced to treat. Daniel didn't drop the ball right at the end either and gave us a glorious two page splash for the cliffhanger. Outside of thinking that the armor the goons were wearing was a little weird for my taste I have no complaints for the art in this issue. Cover Art - 5: This was a fun, actiony cover. The fold out gimmick could have come off as cheesy but like the story itself it felt both contemporary and old school at the same time. Fun fact; if you buy this book off of a newsstand in a bookstore it doesn't have the fold out cover. Variant Cover Art - 5: This is a more traditional first issue in an arc cover. I would have been just as happy with this cover as the one that served as the main one. To my mind this image would make a fantastic New 52 Superman poster.